Grover’s Corner is a simple homestead at the intersection of the Southbank River Road and the Grover’s Branch Trail which winds into the Shell Hills where a Royal silver mining mill is in operation. Captain Barksmith, of the 13th Royal Rearguard which is tasked with protection of the mill and the trade route along Southbank Road to Habernaki Station, received report of a Fancy Marine company operating in the Shell Hills with an allied Hornbred Lintyan Warband. 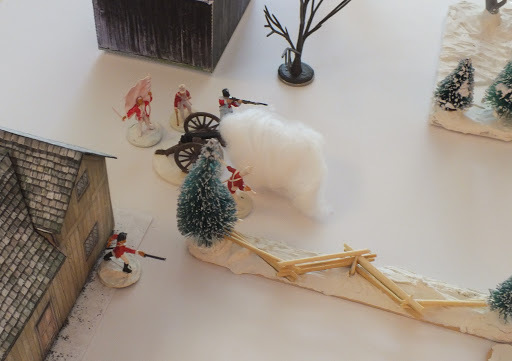 The Captain dispatched Lieutenant John Harvey with a single platoon of regular redcoat light infantry from the 13th Regiment to supervise and assist the First Iohi Provincial Guard, along with their single field piece, a 3-pounder, to set up at the intersection of Grover’s Corner. 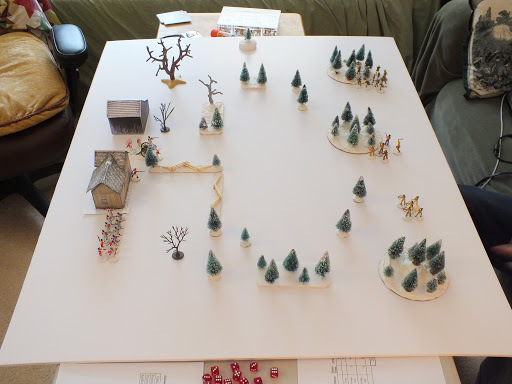 I’m playing the Redcoats and have a Defense objective: I start with 2/3 of my force of 200 points on the table, choosing my Provincial Artillery and my platoon of Regulars in line formation. The other 1/3 of my force is off table, the Provincial Guard unit, and will arrive on a turn determined randomly. I win my objective if I can keep the enemy at least 4″ away from both buildings. 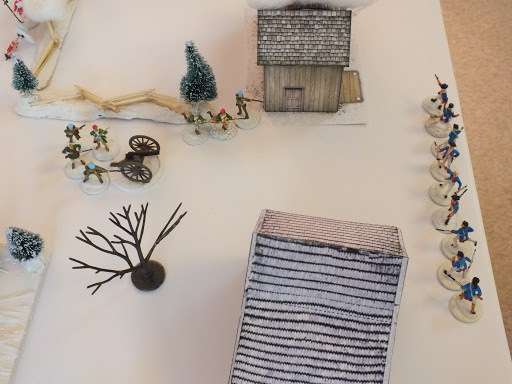 My Usual Opponent sets up on the opposite side of the table with a Recon objective–he needs to move units through every square foot of the board and have at least 1/3 of his force survive the encounter with the Redcoats. We roll some interesting Side Plots: my officer has a score to settle with the sergeant who beat him at cards the other night, and his Side Plot is to get the platoon of Regulars all killed; my Opponent’s lieutenant has a death wish and is determined to die in battle. On a crisp but sunny afternoon, lookouts at Grover’s Corner spot warriors of a Hornbred Lintyan Warband approaching from the forests across the road. Lieutenant sends word back to the Provincial Guard to assemble and form up on the road while giving the command for the 3-pounder crew to open fire immediately. 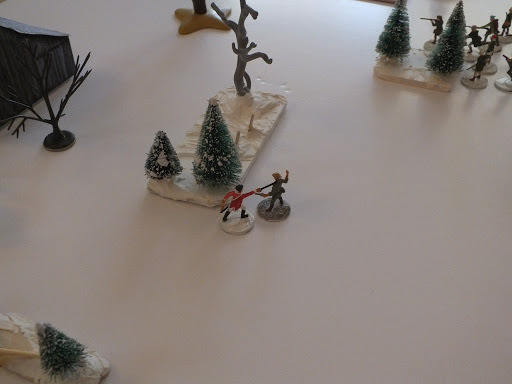 The cannon shot flew straight and smashed through two warriors of the Lintyan Warband; the rest of that party turned and fled back into the woods. Second turn, the Special Event card comes up and we roll on the table. Result: each officer moves directly toward the other, each time any special event card is drawn for activation, until they reach each other and must fight until one is dead. 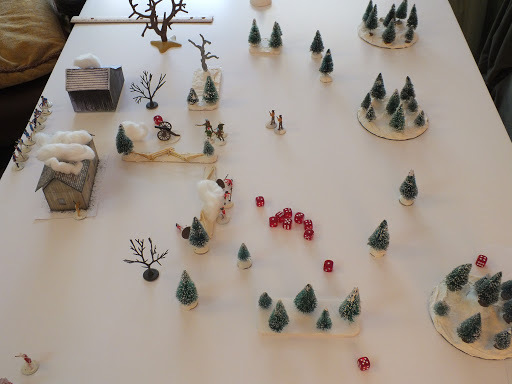 Of course, this fits perfectly with my Usual Opponent’s Side Plot–by the end of the turn our officers are engaged and each survives the first round of melee. (He has the dodge special ability and Lt. John Harvey has the same.) But the second round both officers score hits, and both hits prove lethal. Rolls for dodging fail. 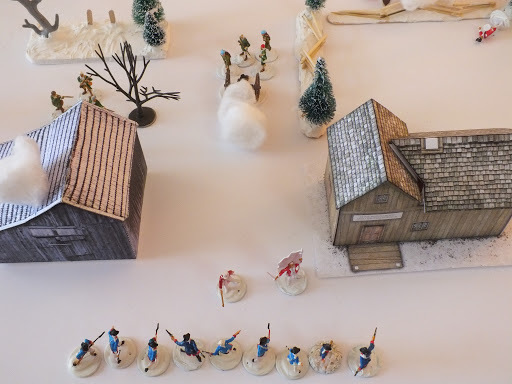 Both officers fall in the middle of a snow covered field between their respective forces, and only soon after the first volleys were fired. 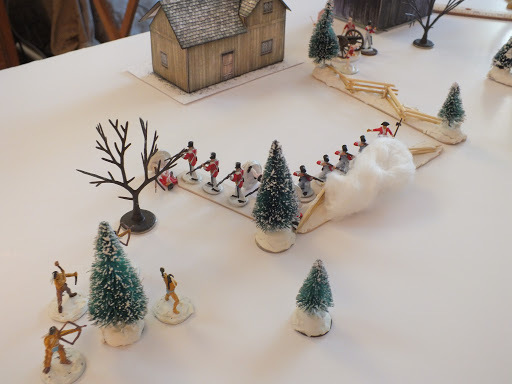 Moving to secure the fenceline until the Provincial Guards arrived, the Regular infantry take up single file firing lines and begin pouring lead into the trees where another Lintyan Warband is sneaking up along one flank to scout the Redcoat’s side of the field of battle. The Lintyan warriors lose only 1 of their warband to musket fire and close to chop apart the line of regulars; by the end of the fighting, only 1 warrior remains standing, covered in blood, but the remaining Regulars have lost their nerve and run straight into the musket fire of the Fancy Marines. Meanwhile, on the other flank, the Marines de la Campaigns maneuvered through the trees on the other side of the field and opened fire, at close range, on the artillery crew–only one artillerist fell to a mortal wound, but the rest of the crew completely lost their nerve and turned to run, leaving the gun to the enemy (the flag bearer carried a white flag, after all). The Provincial Guard arrive on turn 3, but the artillerists sustain another casualty and flee for the hills. A contingent of the Marines turn the reloaded gun around and fire a wild shot at the approaching Provincials. It’s not technically in the rules, but we both decided to make an exception for the sake of the drama (as if anything could be more dramatic than the officers charging toward and killing each other in a sword duel). 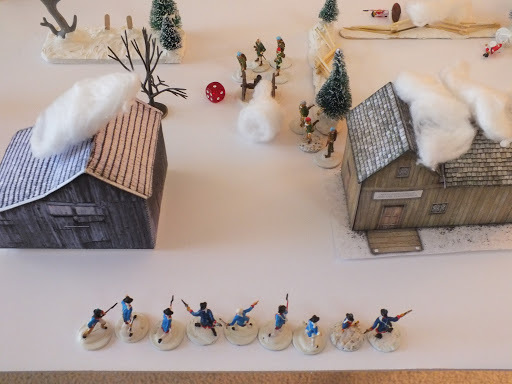 With the artillery crew gone and the Regulars whittled down to a drummer boy and a fifer, most of the Fancy Marines and a single Lintyan warrior took cover behind buildings. The Marines fire another cannon shot at the Provincials, but with a 1 result rolled the shot goes high. The Provincials stand and deliver musket fire which prompts the Marines to abandon the 3-pounder and take up their muskets. The game ends on turn 4. 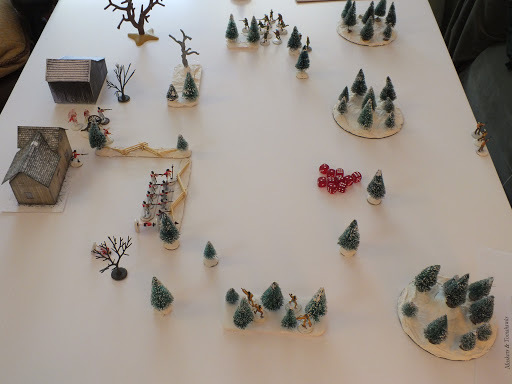 The Fancy Marines and Lintyans achieved their main objective of scouting each sector of the table and the officer side plot of dying a glorious death in battle were both achieved. The Royals failed their main objective of keeping the enemy 4″ away from the buildings, and although the Regular platoon was nearly destroyed, it wasn’t entirely, and the officer’s side plot also failed to materialize. Complete victory to the Fancy side. Great bat-rep. A fun read! The Side Plot with the leaders was totally cinematic. And that was a fantastic idea to allow the enemy to capture the artillery piece. Very inspiring to come up with some interesting scenarios of my own! I’m not sure how I missed reading this battle report last year. But it was fun to read. I have not used Artillery much in my M&T games but it certainly seems to be well balanced and comes with its own cinematic feel for the period.